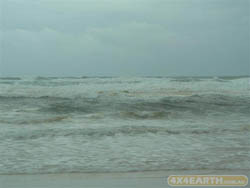 Fraser Island is the largest sand island in the world, it is also a island that you need use 4x4 driving and cars. The island is criss crossed with tracks that run across the island and with the beach surrounding the island explore the nature and beauty of World Heritage listed Fraser Island. All vehicles traveling to Fraser Island must first have an official permit from the Department of Environment and Heritage offices in Brisbane or on the Fraser Coast (Hervey Bay, Maryborough & Rainbow Beach). We had an exciting holiday there over christmas 2007, due to the wild weather which had made driving on the beach practically impossible (we were actually advised to leave the island due to the weather), but my friend suggested we head inland and explore the interior of the island. We had to camp basically in home owners front yards which was awfully nice of the locals because there was alot of campers. We were really suprised at the amount of people that stayed through the bad weather, but all enjoyed themselves and got to 4wd in extreme elements. I want to take the family back there another time, when the weather is not being driven by tropical cyclones.